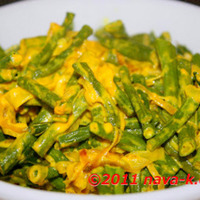 150g long beans/kacang panjang - cut into 1 1/2 inch length. Add cumin seeds and continue to stir for a minute. Put in the rest of the ingredient and cook to soften beans. I enjoy vegetables. This looks like our version of string beans in coco milk.